China is undergoing a self imposed slowdown. The current account had declined and actually moved into deficit. Credit creation by banks and the government has been shutdown and effectively not added to the stock of money in the economy since 2016. This slowdown comes at a time when other governments and central banks are also slowing down fiscal expenditures and bank balances. The purpose of this article is to look at the macro sectoral flows and assess whether China is a good place for investment. China at present is going through what can only be described as a self-induced slowdown. The vital statistics for the currency, GDP and stock market are shown below. The CNY is falling back to levels seen in January 2018 and is depreciating. Mr. Robert P Balan has written an excellent article on this subject here. GDP continues to rise, but more slowly than before. The stock market has fallen since the beginning of 2018 and has not yet found a bottom. The stock market moves with the currency, currency down = stocks down. A balance of sectoral flows model was used after the work of British economist Professor Wynne Godley to assess China. In 1970, Professor Wynne Godley moved to Cambridge, where, with Francis Cripps, he founded the Cambridge Economic Policy Group (CEPG). In early 1974, Godley first apprehended the strategic importance of the accounting identity - which says that measured at current prices, the government's budget balance, less the current account balance, is by definition equal to the private sector balance. By definition, the stronger the private sector balance is, the stronger the private domestic economy and markets within it. The community, business, and the stock market are located in P. For P to expand, it needs the balance of inputs from G and X to be positive. A negative balance causes P to contract. When one adds all three sectors together, it equals the GDP for that year. One sector's loss is the other's gain, and if they all go down, so does GDP. One can calculate the private sector balance by adding the current account balance and the government budget and expressing it as a percentage of GDP. As an accounting identity, this must sum to zero overall as a percentage of GDP. * Estimate as actual numbers not yet officially released. # Forecast based on existing flow rates and plans. One sees that the private sector balance has steadily decreased from 2016 to the present day. The decrease has come from both a declining current account surplus and declining national government expenditure. Notice how small the current account is a percentage of GDP and how the current trade war will have little strategic effect on China overall. This subject is covered in more detail in this article. The private sector balance, and therefore asset markets, is also reinforced by private credit creation from private banks. One can say that aggregate demand in any period is GDP + Credit. The chart below was prepared for me by Mr. Robert P Balan and his PAM team. What the chart shows is a general rolling over of fiscal flows in China. Government fiscal flows can be projected forward into future years as much expenditure is planned years ahead and well documented. What the chart is showing is a general slowdown in China from falling government expenditure and also credit flows (which come largely from the government too). One can see from the 2010-2014 days of 30% plus credit creation the rates fell into the 5% range during the slowdown in 2016 and now going into the future as far as 2020. Private debt summed about 209% of GDP, which is high by developed world standards. Professor Steve Keen, an expert on private debt, says that 150% of private debt-to-GDP is the point at which most economies tend not to take on any more debt. It is a natural barrier. China's private debt levels come with an important caveat. The caveat is that while the household debt is private debt, the corporate debt belongs to state-owned corporations issued to them by the state. This state-sponsored debt could be considered sovereign debt. China is a monetary currency sovereign and the only legal creator of the Yuan in the world. China can never go bankrupt in its currency; there is never a solvency issue. For this reason, corporate debt owned by state-run enterprises is unlikely to lead to a financial crisis as happens in western economies. In which case the true level of private debt is just over 40% of GDP which is low by any standard. Present and forward plans show that credit has plateaued since 2016 and looks to remain that way into 2020. 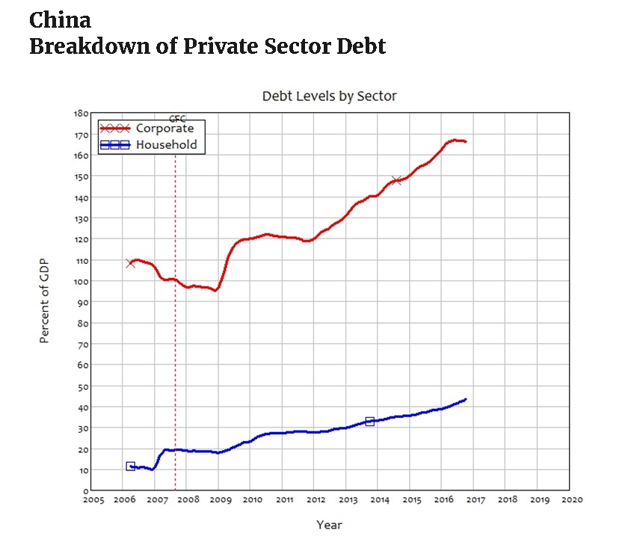 China has a positive but declining private sector balance, and this allows assets in the private sector such as stocks, bonds, and real estate to rise in value but at a lower rate of change. The central government may well be of the opinion that too much of the credit creation before 2016 went into speculation in paper assets and land, and not enough into real assets such as factories infrastructure and public services. The credit cutback now may be aimed at letting the steam out of the inflated land price. Most western economies suffer from an inflated land price. Private banks in the west lever the land price ever higher with mortgage credit. This leads to high rents which in turn put pressure on wages and the general cost of living and doing business. Note that the land is worth more but no more has been produced, and the land is not more productive. Pumping the land price higher with mortgage credit is not a productive use of credit. Such a practice leads to the expansion of the land price at the cost of investment in productive assets. This process is known as Ricardo's law of rent and says that whatever improvement is made on or near the land will be captured by the land price and the landowner as a higher rental income for which no additional value is created, the very definition of inflation. The landowner becomes a free rider and toll on the economy while adding nothing productive to it. Reversing this process and putting land and credit to productive use is the key aim of the Georgism movement. A movement that seeks to apply the teachings of 18th Century American economist Henry George. If that is the aim of the central government, then asset prices such as land and paper will fall. This lowers the land price, rents and the cost of living and doing business. Ultimately the economy is more productive and competitive. Credit creation can be directed to investment in productive assets that add value. 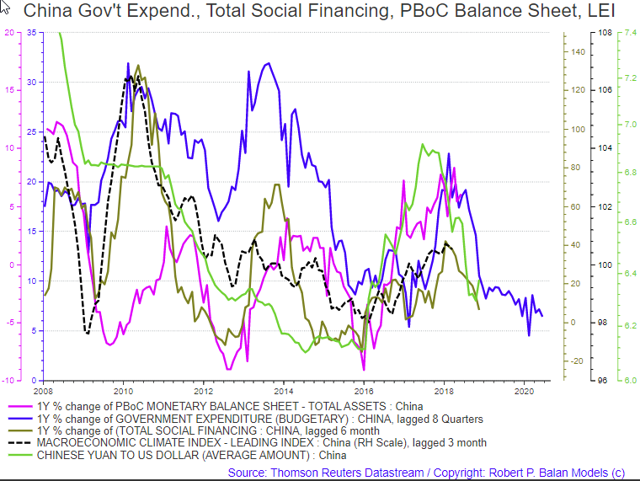 The slowdown in Chinese fiscal expenditure joins an unfortunate global trend illustrated in the chart above, also from Mr. Balan and this recent article. The simple takeaway is that when the Monetary Base of the big global Central Banks falls, so do asset markets and it is going to fall into the future like nothing we have seen before. 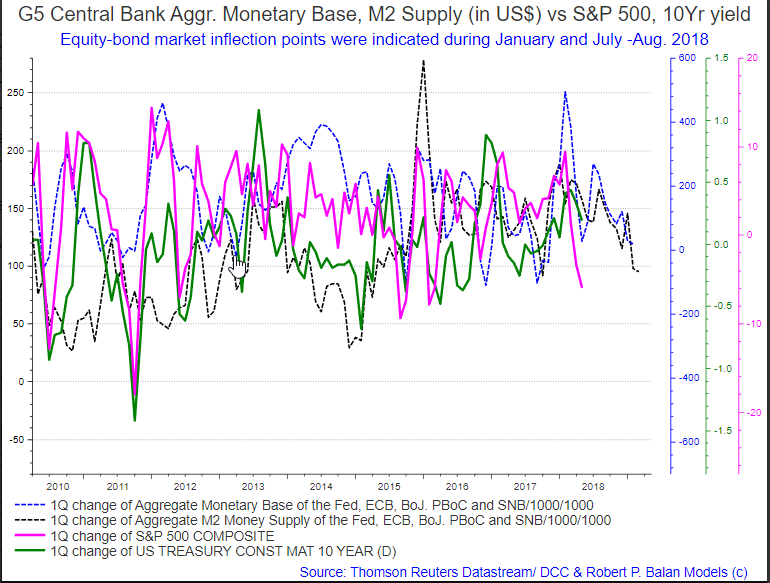 The black dotted line on the chart above is falling in line with central bank balances as assets are sold. This line can be projected into the future due to announced buying and selling rates by the central banks. Every recession is different from the one before and catches most by surprise. If that were not so, mainstream economists could recognize them a long way off. The fact is they cannot because their models and paradigm are still stuck in the days of the gold standard that ended back in the 1970s and no longer apply. It has never occurred before that the world's central banks have unloaded their balance sheets all at the same time. QE has never occurred before on a global scale. QT has never occurred before. This is new territory. The way the politicians and central bankers are mishandling this is a guarantee of a recession and stock market panic "that no one could foresee." They have to be different each time; otherwise, they would not occur. It will be glibly termed a "Black Swan" event, an external shock that no model could predict except for Professor Steve Keen's Minsky Model. 1. Paper asset prices will generally fall as global central bank support is withdrawn. 2. Bond yields will rise and face values fall. The yield rises only because the face value has fallen. 3. The US dollar will soar as liquidity gets soaked up by the bond buying despite the "twin deficits."